The Intercontinental GT Challenge series powered by Pirelli debuted in 2016. The idea behind the championship is to reduce expenses by using local cars and teams. Drivers and engineers from around the world participate in the events but costs and time would be reduced by not having to ship equipment to the four different continents where the races were held. 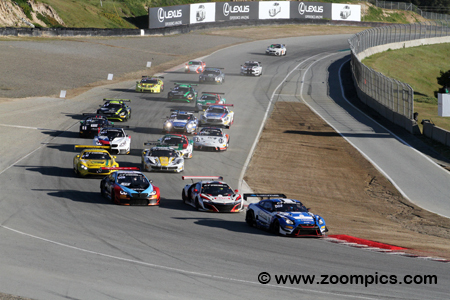 This year’s California 8-Hours at WeatherTech Raceway Laguna was round two of the five-race series. The championship began at Bathurst, Australia in February. After the American event, the teams will compete in a 24-hour race at Spa, Belgium. Spa will be followed by the Suzuka 10-Hours in Japan. The finale will take place in South Africa at Kyalami. Grand Touring 3 (GT3) – This is the quickest class and includes cars that fall into the FIA GT3 category. These are two-wheel drive vehicles that may use normally aspirated or turbocharged engines which produce approximately 500 horsepower. Examples of cars competing in this category include: Porsche 911 GT3 R, Lamborghini Huracan GT3, Mercedes AMG GT3, McLaren 650S GT3, Callaway Corvette C7 GT3-R, Bentley Continental GT3, Audi R8 LMS and Ferrari 488 GT3. Grand Touring Cup (GTC) – The GT Cup class was initially for 2015-2016 Porsche 991 GT Cup cars. It now includes vehicles from other spec series – the Lamborghini Super Trofeo (Lamborghini Huracan Super Trofeo) and Ferrari Challenge (Ferrari 458 Challenge) championships. Grand Touring 4 (GT4) – The cars in this class are similar to the GT vehicles but have more preparation restrictions. Drivetrain layouts include all-wheel-drive and front and rear-wheel drive. These cars can be powered by forced induction or normally aspirated motors. Racing in this category is the Chevrolet Camaro GT4, McLaren 570S GT4, Porsche 718 Cayman GT4 CS MR, Audi R8 LMS GT4, Ginetta G55 GT4, BMW M4 GT4, Audi R8 LMS GT4, Mercedes-AMG GT4, Panoz Avezzano GT4 and SIN R1 GT4. As the championship features a multi-driver format which includes professional and sportsman racers, there was a need to categorize competitors. Within the Grand Touring category, the driver combinations are grouped as GT Pro or GT PAM. The third consecutive California 8-Hours is the longest professional race conducted on the 62-year-old 2.238-miles eleven-turn WeatherTech Raceway Laguna Seca road course. 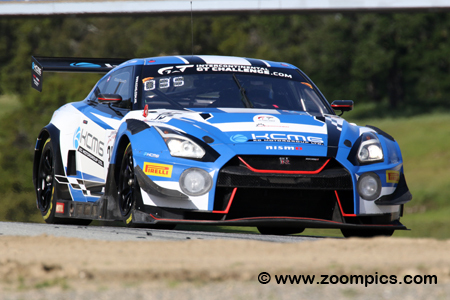 Second fastest qualifier, Alex Buncombe driving the KCMG Nissan GT-R beats the Acura NSX of the pole-sitter, Mario Farnbacher to WeatherTech Raceway’s corner two to lead the first lap. Challenging Farnbacher for second is eighth place starter, Nicky Catsburg in the No. 34 BMW M6. The eight-hour event was completed without a single full-course caution period. Seventeen of the twenty entries were running at the checker. The team from Taiwan, HubAuto Corsa didn’t fare very well in the opening round at Bathurst but they redeemed themselves in the California 8-Hours. The No. 27 Ferrari 488 GT3 was piloted by Miguel Molina and Australians Nick Foster and Tim Slade. Foster performed the qualifying duties and was fourth quickest in the Pole Shootout. In contention during the entire contest, the trio won by a margin of 12.509-seconds. The No. 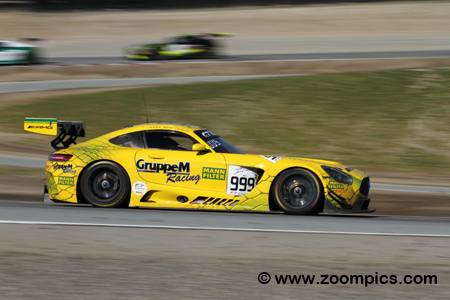 999 GruppeM Racing Mercedes-AMG was driven by Maxi Goetz, Maxi Buk and Raffaele Marciello. The trio which finished third in the opening round at Bathurst were gridded tenth for the start of the eight-hour event. They moved their way up the race order and earned a runner-up finish. Their effort increased Mercedes-AMG’s first place in the Manufacturer Standings and gave the three drivers the championship lead. 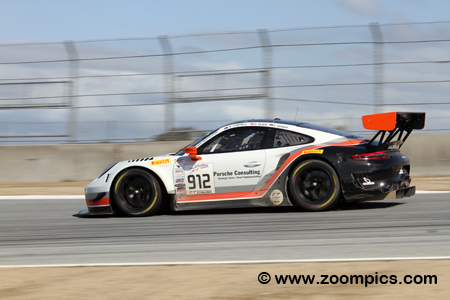 Two American GT3 teams were entered in the event – Park Place Motorsports and Wright Motorsports. Park Place prepared the No. 911 Porsche GT3-R for drivers Romain Dumas, Mathieu Jaminet and Sven Muller. During the Pole Shootout, Jaminet was eighth quickest. In the race, the trio moved into contention and battled for the lead. They finished 20.768-seconds behind the winners and earned the final spot on the podium. Although Honda Team Motul was making their series debut, they gave notice during practice that they would be a contender. Mario Farnbacher set the pace in the pre-qualifying session and grabbed the top spot in the Pole Shootout. 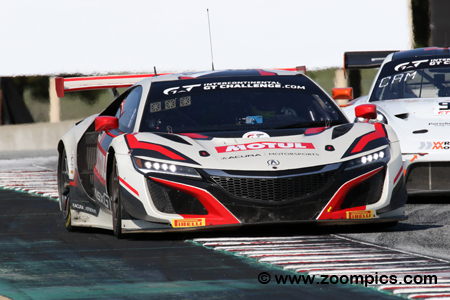 Sharing the Acura NSX with Farnbacher were Bertrand Baguette and Renger van der Zander. 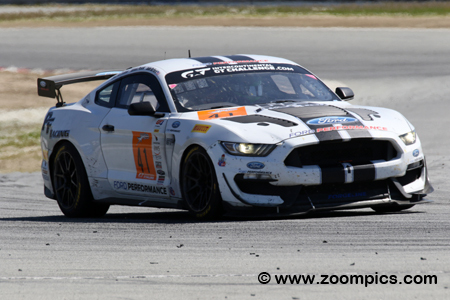 Unfortunately, a couple of pit lane incidents and a right front suspension failure took the team out of contention. At Bathurst, there was a single Lamborghini entry which failed to finish. 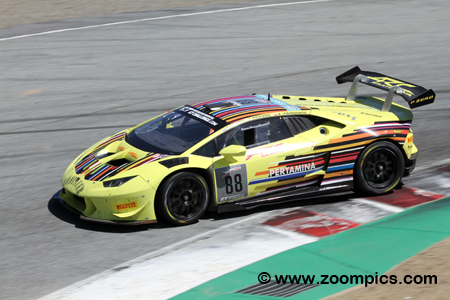 At WeatherTech Raceway, the ARC Bratislava team was not only the lone Lamborghini but also the only entry in the GTC Cup category. Drivers Miroslav Konopka, Andrzej Lewandowski and Zdeno Mikulasko were gridded sixteen overall for the start of the contest. Running a relatively trouble-free event the trio was fourteenth overall at the checkered flag. Sharing the No. 35 Nissan GT-R was Katsumasa Chiyo, Joshua Burdon and Alex Buncombe. The group earned a spot in the Pole Shootout and Buncombe had the honour of setting the second quickest time. He started the race and was in first place by the second corner. Buncombe led hour one but the team lost their advantage during a slow pit-stop. Another long stop to repair damage resulted in a twelfth place finish. 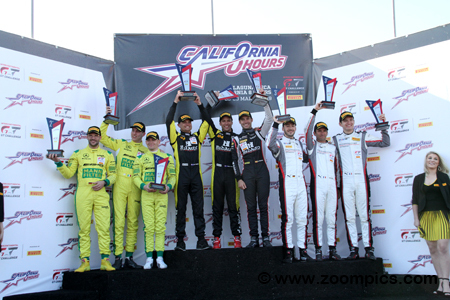 The overall and GT3 podium at WeatherTech Raceway Laguna Seca for the California 8-Hours Intercontinental GT Challenge event. To the left are the runner-up’s and new points leaders, Maxi Buhk, Maxi Goetz and Raffaele Marciello. On the opposite side of the rostrum from Park Place Motorsports are Mathieu Jaminet, Sven Muller and Romain Dumas. And, in the center are the winners, Miguel Molina, Tim Slade and Nick Foster. The No. 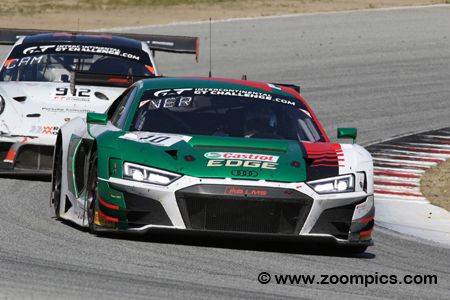 10 Audi Sport Team WRT Audi R8 LMS won the inaugural California 8 Hours in 2017. This year the Audi was raced by Frederic Vervisch, Christopher Haase and Dries Vanthoor who was third quickest in the Pole Shootout. The team was unable to match the pace of the leaders but a steady performance after eight hours of racing netted them a fourth place. They were also the last car to finish on the lead lap. 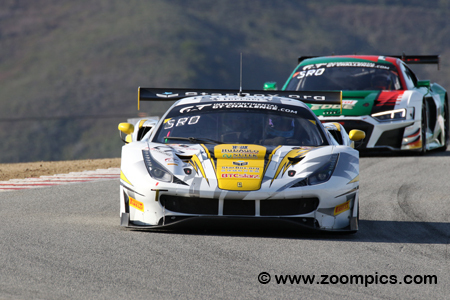 There were only three GT4 entries – PF Racing, TRG – The Racers Group and RHC Jorgensen/Strom. 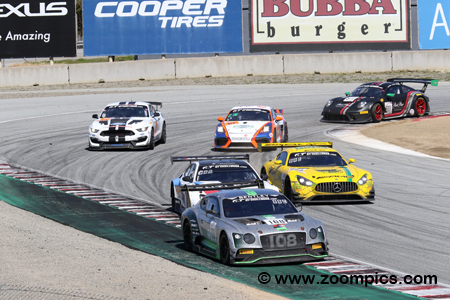 The RHC Jorgenson/Strom and The Racers Group also participated in rounds three and four of the Pirelli GT4 America SprintX – West championship. But it was No. 41 PF Racing Ford Mustang GT4 driven by Jade Buford, Jason Pesek and Chad McCumbee that captured the class victory by a seven-lap margin and finished fifteenth overall. It started out as a promising weekend for Bathurst 12-Hour winners, Matt Campbell, Dennis Olsen and Dirk Werner. 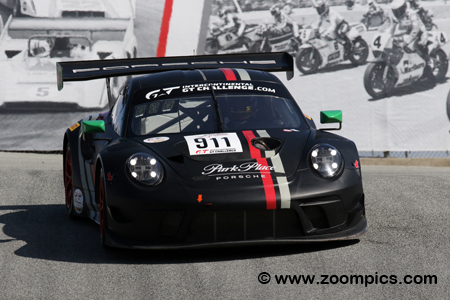 In the Pole Shootout, Campbell was fifth quickest driving the Wright Motorsports prepared Porsche 911 GT-R. The trio was in contention until midway through the contest when they encountered a transmission issue. Unable to make repairs in a timely manner the team retired the Porsche on lap-168. Augusto Farfus driving the No. 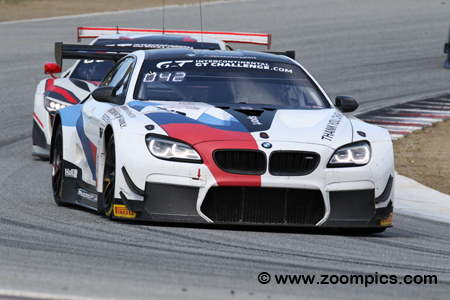 42 BMW Team Schnitzer BMW M6 GT3 was seventh fastest during the Pole Shootout. In addition to Farfus, the BMW was shared by Chaz Mostert and Martin Tomczyk. During the race, Tomczyk hit the Audi Sport Team Land Audi R8 LMS GT3 EVO of Markus Winkelhock and received a drive-through penalty. The trio finished fifth which meant there were five different manufacturers in the top-five. 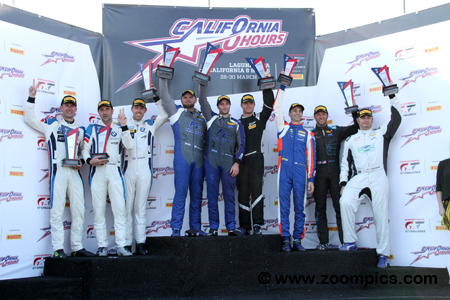 The California 8-Hours GT4 podium at Mazda Raceway Laguna Seca. In the center are the class winners from PF Racing, Chad McCumbee, Jade Buford and James Pesek. To their right are the second place finishers, Daren Jorgensen, Brett Strom and Jonathan Miller of RHC Jorgensen/Strom by Strom Motorsport. Completing the podium are the trio from TRG, Chris Bellomo, Jason Alexandridis and Spencer Pumpelly.